Members of a university free speech society are to be sent on a diversity awareness course after an investigation into allegations of racism. Liberty Union at the University of Kent was found to have breached the student's union guidelines after group chat messages were published online. The society said the "offensive" comments were made by a few, and "rues" that the whole group is being punished. It has been suspended for the remainder of the academic year. 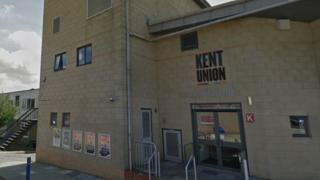 Kent Union imposed sanctions on the society after an investigation which began last month concluded it was "in breach of our Student Disciplinary Procedure". The society had previously been suspended when the inquiry began, but that suspension has now been extended. In messages published in a blog by Kent Anti-Racist News, members of the union talk about people being "put down" and "first on the trains". One suggests establishing a neighbourhood watch group with "cool brownshirts", appearing to reference Hitler's Nazi militia of the same name. The society must implement new social media guidelines, and members undergo training in diversity before Kent Union will consider reinstating it. In a statement online the Kent Union said: "Equality, diversity and inclusivity remain a key aspect of the work and values of Kent Union." The Liberty Union previously said the "jokes" had been "taken out of context", and while they were "offensive and distasteful", they were "not intended maliciously" and did not represent the views of the society. In a statement on Friday it added: "We rue the fact that the entire society has been punished for the distasteful comments of a few." It added the people who commented made up 8% of the group, and they have now been suspended, while people with ethnic minority backgrounds account for 30% of the group. It acknowledged it was responsible for not monitoring the group chat, and said it was pleased the investigation panel found the group was not "inherently racist". The messages were leaked by a society member following a debate into the far-right terror attack in New Zealand, in which 50 people died. The names of some individuals who made the comments have been passed to the university "for their consideration". The university confirmed it would consider the outcome of the hearing when the term reconvenes.